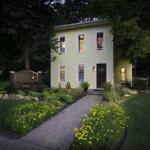 Private cottages with several bedrooms and full kitchens await at Kara's Kottages Bed and Breakfast in Kalamazoo. This property consists of six private multi-story cottages. All of the cottages are equipped with modern furnishings flat-panel TVs full kitchens and electric fireplaces to accentuate the mood on cold evenings. Kitchens come stocked with breakfast options and every unit has a patio. Laundry machines are available on-site. Kara's Kottages are five minutes' walk from downtown Kalamazoo and a mile from Western Michigan University. South Kalamazoo Mall is less than two miles from the property. Lake Michigan is a one-hour drive and Detroit Metropolitan Wayne County Airport is 125 miles away.